Old Babushka, known throughout all of Moskva for her beautifully painted eggs, is preparing her eggs for the Easter Festival when she takes in an injured goose. She names the goose Rechenka, and they live happily together until one day when Rechenka accidentally overturns a basket, breaking all of Babushka's lovingly crafted eggs. But the next morning Babushka has a surprise awaiting her in the basket. She cries: "A miracle!" It is one of many in this charmingly told tale of friendship and caring. With vibrant illustrations, Patricia Polacco has joyously re-created the flavor of Old Moscow and its festivals. The eggs, stunningly colored and intricately designed, are authentic reproductions of eggs painted in the Ukrainian style. 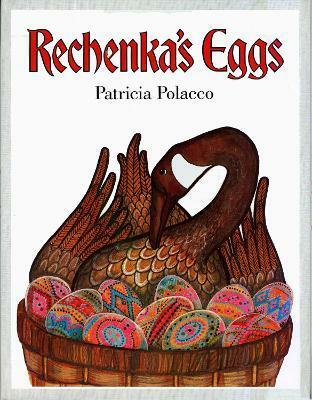 Rechenka's Eggs is a timeless story of classic beauty. "I did not start writing children's books until I was 41 years old. Mind you the "art" has always been there for me most of my life. Apparently one of the symptoms of my disability in academics is the ability of draw very, very well. So drawing, painting and sculpture has always been a part of my life even before I started illustrating my books. The books were quite a surprise, really. Mind you, I came from a family of incredible storytellers. My mother's people were from the Ukraine and Russia...my father's people were from Ireland. My extended family, (Stewart's family) were from the bayous of Louisiana...also great story tellers. When you are raised on HEARING stories.....NOT SEEING THEM, you become very good at telling stories yourself. So at the age of 41 I started putting stories that I told down on paper and did drawings to help illustrate them...I guess the rest is history.